What is the Westportif Cycle challenge? This Sportif (leisure cycle) has 3 distances ( 80k, 120k and 160k) to suit all abilities, it’s set over a rolling course taking in most of the picturesque parts of Mayo and Connemara. The bike sections are all on sealed rural roads, but bring a spare tube and pump in case of a puncture as you need to be self sufficient. Remember to fit at least one water bottle to your bike as it’s important to take on fluids. Advanced – If you are a competitive cyclist, experienced sportif/ leisure cyclist or fitness enthusiast and are extremely active every week, we expect the first participants to finish the 160k route in around 5 hours, 3.45hrs for the 120k and the 80k in about 2.45hrs. Intermediate – If you are starting training with a good level of fitness, maybe train twice or three times a week, but have never tried a Sportif event before. We recommend the 120k route for intermediate cylists. Times to complete (Approx) 160k in around 6hrs, 120k in 5hrs and the shorter 80k event in 3.30hrs. Beginner – If you are starting from a low level of fitness and this is a whole new challenge for you we would recommend that you start by aiming to complete the 80k route inside 5 hrs. All of the above times are actual cycling time on the bike and don’t include stops. There are two options for participants to sign on for the event. Friday 11th May Monaghan & Sons Castlebar 3.30pm – 8.30pm – Located here. Safety first; you should ensure that the bike is properly serviced, with working brakes; you want to feel safe and confident on your bike. You must OBEY the rules of the road at all times as the race will be held on open roads. Wearing of a helmet is compulsory while cycling; it can be left with the bike at the transition areas while on the running sections. What age do I have to be to enter? Participants under 18 must register with a parent or guardian. The same parent or guardian must accompany the participant around the route. 12 years of age is the minimum age limit. • A road bike (racer) would be fastest choice. • A mountain bike with slick tyres would be slower. • A mountain bike with knobbly tyres would be slowest of all. What other items may I need? 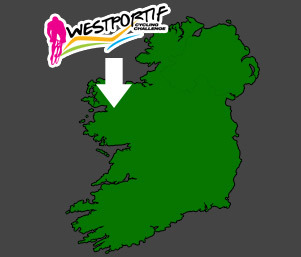 You could rent a bike from Westport rent a bike but book early to avoid disappointment. Can I get a refund if I do not attend ? When paying for your entry on line it is stipulated that this is a non-refundable payment. As soon as a participant enters we incur costs such as admin etc. It is also not possible to transfer entries to any other Events, next year’s event, or a different competitor. Will there be food and water stops? Can I practice on the course beforehand? We encourage you to use the course maps to practice on this most picturesque route in advance. Do I have to navigate on the Course? While navigation skills are not a requirement, do not travel faster than your route knowledge. The route will be described and marked with signs/arrows; there will be marshalls on all the major junctions but always proceed with caution as this is an unsupported adventure challenge. A map will be emailed to all competitors. Will the event go ahead if there is bad weather? If the situation arrives that we are unlucky enough to get weather that may be dangerous to participants, the organizers may have to make a decision to shorten or take out certain sections of the course, and this will only be decided on the morning of the event. What safety rules must I follow? Please obey the event organization at all times, these include the Red Cross, Gardai, Volunteers and all race personal. On the bike cycle obey Cycling Ireland rules. Strictly No IPods or Headphones; If you wear either you will be disqualified on the spot, safety is a huge priority and failing to here instruction or the sound of on coming traffic can cause serious accidents to you, fellow participant and to the general public. What happens after the finish? Get some refreshments, go back to your accommodation and relax, or go for a stroll around the town to the many local cafes and attractions. © 2019 Westportif. All Rights Reserved.